We had a very nice time at Rorak's show this weekend. 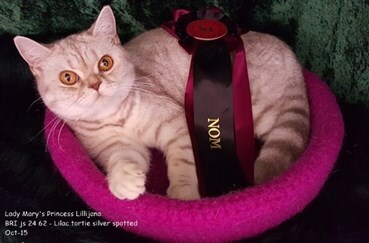 Sc.Lady Mary's Silver Wellin Spirit .1 x Best breeding stud in kat 3 and 1 x Nominated for Best in Show Very nice to meet his son again, Lady Mary's Silver Mowgli wo had 2 x Ex 1 in kitten class. Spirits son Ic.Lady Mary's Hamlet Surprise was made up to Premier, 1 x capib and 1 x Nominated for Best in Show. Hamlet's daughter, Lady Mary's Princess Lillijana 1 x Nominated for Best in Show, sp.sc.Lady Mary's Brown Ximir 2 x HP and Garcita 1 x cagcib.